Triplekite are well known in the UK landscape photography community as the producers of quality books in this little supported genre (read our interview with David Breen here on setting up Triplekite). Nearly all of their books so far have been full size, full length monographs (plus a compilation with our support) and the printing has been superlative throughout. Highlights have been the books for Hans Strand, Paul Kenny, Marc Wilson and Dav Thomas (see here for more info). After this abundance of great work they have decided to produce some smaller books to bring to the public the works of photographers unseen in print or the lesser known work of more established photographers. The first three books in this series are by Greg Whitton - well known for his mountain photographs and winner of outdoor photographer of the year, Chris Friel - prolific producer of abstract multiple exposure photographs, and Hans Strand - Swedish landscape photographer most well known for his Icelandic work but with a broad range of excellent Scandinavian photography. Greg’s mountain photography is without question is some of the best of its type around. Winning the Outdoor Photographer of the Year gave him a big boost in publicity but also in confidence and he has been consistently producing great work. The images included in the book are a combination of ones that have been seen before (see our featured photographer article) and some newbies. They’re mostly of the Lake District, Snowdonia and Scotland but I’m not arguing as they are some of the most beautiful locations in the UK. My particular favourite images are the cover photo of the Langdale Pikes, an intensely moody Scafell Pike hidden in the clouds and ‘Shadows Rising’, a rendition of a snow powdered Glyder Fach and Crib Goch. 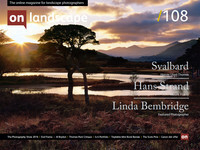 I have long been a fan of Hans’ more intimate landscape and he is a regular contributor to On Landscape. Although the vastness of his Icelandic work has a remarkable grandeur, I feel his own personality is more suited to the intimate moments of nature and this connection comes through in his photography. We have small details of snow and ice, a mountain stream, a quiet lakeside forest or a glimpse of undergrowth - all of these come together to create a feeling of peace in a uniquely Scandinavian sense. Nearly all of the images are from Sweden apart from a couple from Iceland, France and Italy (and a curious inclusion of a Death Valley image with tumbleweed and dead sage - an odd contrast with the sub-arctic feel of the rest of the book). Chris’ work covers a huge range and is added to on what seems like an hourly basis. His portfolio ranges from sublime black and white work personal observations of life so completely abstract multiple exposures - for which he is most well known (see our featured photographer article). It is a range of these multiple exposures that are included here. Chris has found or created dark frames, often distorted through his camera technique, in which to embed his haunting landscape images. These often give the impression of water and gold leaf - a liquid lens on the world that removes all but a trace of the original subject bar an occasional tree branch, wave or rounded hill. The books are 9.5 inches square, hard bound, 48 pages long and include 25 photographs. Most of the photographs are inset although there are a few double page spreads and full page bleeds. The printing is generally excellent but upon comparing the colour of images images against the same pictures on the photographer’s website and in Outdoor Photography, the books had a general cyan cast across all three titles that robbed the images of a little of their life. In terms of value for money, on the one hand these are budget books and are half price in comparison with Triplekite’s usual productions, which makes these ideal to introduce new work or artists to the reader. On the other hand the books have a third of the number of pictures of their full size productions and those images are half of the size. Triplekite do have discounts now and again (I bought the Paul Kenny book with a print for a really good price) and if you can buy all three at a reduced price they would make a good addition to your bookshelf. Personally I would have liked to have seen longer books with bigger images and more supporting material about the photographers. The books can be purchased direct from the Triplekite website and it is well worth subscribing to the mailing list for those aforementioned discounts. If you’ve bought the books yourself, we would love to have your opinions in the comments below.